History, Rice township, Luzerne Co., Pa. Since Rice Township is relatively young compared to the other townships in the Mountain Top Area, the early part of this history synopsis is about that part of Hanover and Wright Townships that is now Rice Township. The original Hanover Township was granted as a county by the Connecticut Company to Captain Lazarus Stewart and his associates in 1770. In 1790 it was divided into eleven townships which included what was to be Wright Township. Wright Township was formed from Hanover on April 12th, 1851 and named after the Hon. Hendrick B. Wright of WilkesBarre. The first recorded white settler of this Mountain Top Area was Conrad Wickeiser in 1798. The second settler was James Wright from the Wyoming Valley. He had to chop out a road before his ox team to his place on the Big Wapwallopen Creek, about a mile Southwest of Penobscot. He built a log cabin and at various times he built three saw mills. The next settler was Harvey Holcomb from Connecticut. He located a short distance down the creek from Wright's. The first settlers in what is now definitely Rice Township were Samuel B. Stivers and William Vandermark. They located in the vicinity of where St. Martins Church now stands. They were natives of this County. A John Hoffman also soon settled near the Stivers' place. The next settler was Cornelius Garrison, who built a saw mill on the Big Wapwallopen Creek in the vicinity between Church Road and Blytheburn Area. He also raised the first crop of grain and set out the first orchard. The first road in the area was the Wilkes-Barre and Hazleton Turnpike which ran diagonally across the area from Solomon's Gap to Albert. Some historians claim it followed what is now Main Road, and some claim it ran from Brown Street at Mountain Top through Heslop Road to Albert. We do know from old residents long since departed, that a turnpike did exist in the Brown Street -Heslop Road Area. There was also an old inn in the area of Boyle's Pond. The first schoolhouse was built of logs in 1840 and stood near S.B. Stivers' place. The first teacher was a man named Charles Fine. Some of the original pupils were George and Andrew Carey, Hiram Arnold, and Benjamin and Elizabeth Vandermark. The first store was kept by Stephen Lee near S.B. Stivers' Place. He also was the pioneer blacksmith of the area. James Wright kept the first tavern where he first located. Almost everyone kept liquors to stimulate the weary traveler. The pioneer postmaster was William G. Albert. His office was near the present Albert's Corners. The mails came at first once a week on horseback. Afterward a firm named Horton & Gilchrist of Wilkes-Barre, started a stage line between Wilkes-Barre and Hazleton, and then the mails were received three times a week. This is about as much of the early history that I could get reliable data on. In 1928 Wright Township was split in two with Rice Township being North of the Big Wapwallopen Creek and Wright Township being South of the Creek. In 1903 the Wilkes-Barre and Hazleton Railroad opened up a rail line from Ashley to Hazleton, running through Rice Township. At Ashley passengers transferred to a local streetcar to finish the trip to Wilkes-Barre. In 1908 the line was finally finished to the city proper, by means of a private right of way and a large steel viaduct, which crossed over a number of other railroad lines in reaching the Wilkes-Barre terminal on the third floor of a building on N. Pennsylvania Avenue. After leaving Ashley the line passed through a 2800 foot tunnel through the mountain. Interstate 81 pretty much follows this route. In Rice Township the station was called Nuangola Station, a name this community still carries. There was also a rail siding and freight station located here as well as a power house to furnish electrical power to the rail line, this being a third rail system electric railway. The power plant was operated by the late Fred S. Pettit until the closing of the railroad in September, 1933. The railroad folded due to the advent of new roads and private autos, busses and trucks. The Nuangola Station area as well as Blytheburn and Nuangola were populated mostly by Summer residents in the 1920's and 1930's. At one time Wilson Cross of Nuangola operated a jitney bus between the station and Nuangola. A few of the older homes in the area are Don Pettit's home, Kate Buff's, and the old Thomas home, recently torn down at the corner of Nuangola Road and Front Street. In the 1920's -1930's, a big industry of the Rice Township Area was the harvesting of ice in the upper and lower ice dams, situated between Nuangola Road and Pine View. There were two large ice houses, one at each dam, where the ice was stored. A railroad siding of the Wilkes-Barre and Hazleton Railroad served the ice houses. Freight cars were loaded and an electric train hauled the ice to Wilkes-Barre and Hazleton to be sold to dealers. With the growing popularity of the electric refrigerator, the ice industry faded into the past. "In 1888 Mr. Foley put a well down on his 50 acres of land northeast of the present homes of Joseph Willams and Donald Eroh (Robert St.). In 1890 he put a five room house of stone on the property and cleared a piece of land for living space. In 1905 he married and in 1906 he brought his family to live there. In 1912 he rebuilt the home to the present size. It is now the home of Mr. and Mrs. Vincent Grasso. In 1908 he sold 18 acres of land to Mr. Jacob Rauscher who in turn sold pieces to Lambert Schwingen and Frank Loman. The William Mead family bought Loman's property in 1919 and sold it again in 1929. In 1888 and before, there were Mr. and Mrs. Chester Stivers, (Mrs. Catherine Buff is a granddaughter), Mr. Robert and Mrs. Mary Frankinfield (Mrs. Harry Benning, Mrs. Jack Kogut, Mrs. George Hofmister are granddaughters). Mr. and Mrs. William Smith had a log cabin on the ground we now know as Mantanin's. A small house was built on it by them in 1909. In 1910 they sold it to Mr. Sam Blade who sold it to Mr. Michael Mantanin in 1918. The Smiths bought more farm land, where Charles Bray now lives. They lived there in 1911 to 1915. Mrs. Smith passed on and Mr. Smith sold it to Mr. and Mrs. George F. Borman, and Mrs. Charles Bray is their daughter. Mr. and Mrs. William Smith's daughter Etta and her husband Jack Thompson built my house in 1907-08. Schutinvrien Park, on what is now Heslop Road, is where we had many happy Sunday afternoons until the Valsted Act cut out the beer." "In 1923 my parents, Roscoe and Elizabeth Spencer, bought land from Mr. Rauscher and built a cottage. My brother "Rocky" and I looked forward to Christmas, spring and summer vacations so we could come to the country and enjoy ice skating, hunting, fishing, swimming, and most of all hiking through the woods. We would go to the ice dam and watch them cut the ice. I fell in once not knowing the ice had just been cut. The favorite place at Nuangola Station was Rauscher's Dam, for young and old. In the spring the men would get together to drain and clean it. It was a great swimming hole and all neighbors gathered there. The big thrill was to see the 9:00 p.m. train pull out at night especially Sunday night after the parties held at Schutinvrien Park. All homes and cottages were well lighted from electricity from the third rail. When the last train reached its destination at 2:00 a.m. lights went out until 6:00 a.m. After we were married we made the cottage our permanent home to raise our son, Spencer, in the country we loved so well and knew he would too." Marjory Weyhenmeyer once rode her horse from Nuangola Station to State College, Pa. where she attended Penn State University. 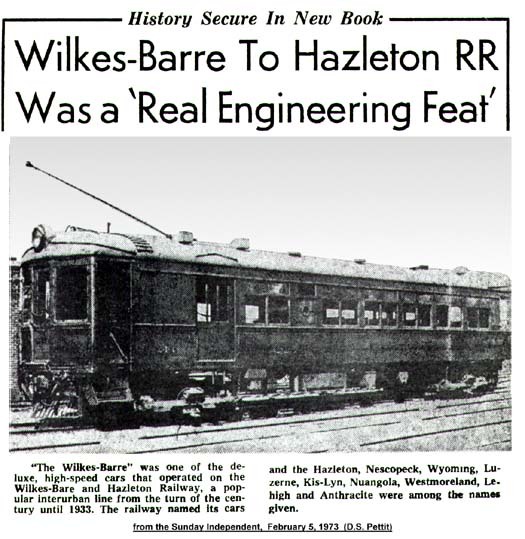 Picture: Wilkes-Barre and Hazleton Railroad high-speed railway car.